This article is about the Formula One team. For the NASCAR team, see Team Red Bull (NASCAR team). 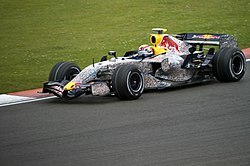 For other uses, see Red Bull Racing (disambiguation). The team suffered a double retirement at the Bahrain Grand Prix; Ricciardo retired on lap 2 with an electrical issue, whilst Verstappen retired two laps later. Ricciardo then took the team's first win of the season at the following race, the Chinese Grand Prix, having started sixth on the grid. During the Azerbaijan Grand Prix, both drivers crashed into each other at Turn 1. The team achieved a podium with Verstappen, during the Spanish Grand Prix securing the 3rd place, while Ricciardo achieved 5th place. At the Monaco Grand Prix Red Bull had a dominant car due to its highly efficient high down-force setup. Ricciardo scored a pole position and a race win, but ran into an engine issue costing him power, he eventually won. This incident re-ignited the bad relationship with its engine manufacturer, Renault. Meanwhile, Verstappen crashed during Free Practice 3 and started from P20 on the grid, finishing the race in 9th place, this race also put an end to Verstappen’s streak of being involved in an incident for the first races. Monaco was also the last race which saw Daniel Ricciardo on the podium with Red Bull, with him parting ways with the team and joining rival, Renault. The European season saw consistent podiums and a good form, with Verstappen winning Red Bull’s home race at the Red Bull Ring during the 2018 Austrian Grand Prix. The second half of the season saw great form from Verstappen and a good development of the car, as Verstappen scored 6 out of 8 possible podiums, and was the driver which scored the most points following the 2018 World Champion Lewis Hamilton. Ricciardo had an unfortunate spree of mechanical issues and retirements during the second half of the season, with him getting 7 retirements in total and no podiums after the first six races coming to the end of the season. Verstappen won the Mexican Grand Prix after pole position was grabbed by his teammate, making Bull’s first front row lockout in the Turbo-Hybrid Era. Verstappen was also finding himself in a back-to-back win at the Brazilian Grand Prix, but clashed with rival Esteban Ocon, costing him the victory. Following the race the drivers conflicted, resulting in 2 days of Public Service, which he completed on 9 February 2019. Ricciardo’s multiple retirements would end up costing both himself and Red Bull key points in the Drivers' and Constructors' Championships. Verstappen would finish the 2018 season in 4th place, just 3 points behind Kimi Räikkönen while Daniel Ricciardo would finish the season in 6th place, behind Valtteri Bottas. Red Bull would finish the season in 3rd place behind Mercedes and Ferrari. Aston Martin Red Bull Racing RB15 Honda RA619H 1.6 V6 t P 10. ^ "Aston Martin: No name clash with Honda's Red Bull switch". motorsport.com. 21 June 2018. Retrieved 12 March 2019.